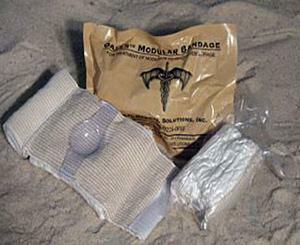 The Olaes" Modular Bandage is the newest product to aid in increasing the effectiveness of modern tactical combat casualty care. No other bandage offers so much versatility in such a small package. Cover minor wounds, apply truly effective pressure dressings, apply occlusive dressings, and have the ability to pack severe wounds with one bandage. Whether you're an experienced medic or a first responder, the Olaes" Modular bandage will be a welcomed addition to your kit. With the advanced features neatly tucked away, an in-experienced individual will not be confused when applying the bandage. It is simply wrapped around like a normal elastic bandage. No hooks or clips. VELCRO. fastener strips secure the bandage throughout the application process and prevent the loosening of the bandage.